Hello everyone! I am back after a much needed break. Let’s just say that my job last week was wide open and crazy. It sapped every spare ounce of energy that I had. So no blogging. That’s okay. 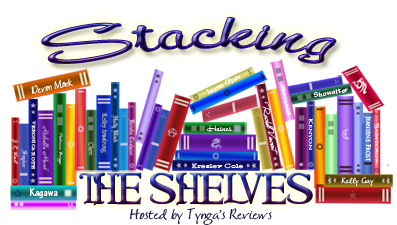 Everyone needs a break now and then, and now I am feeling enthusiastic and ready to face a new week, starting off with a “Stacking the Shelves” post, hosted by Tynga’s Reviews. I’m still trying not to buy too many new books, at least not until I read the ones I have, but then I saw a sale at Amazon. A bunch of their Kindle books were only $1.99 and $2.99. How could I pass that up? Especially when I saw that two books I’ve recently added to my TBR list were among the titles? I couldn’t. In fact, I’m proud of myself for only buying two: Anna Dressed in Blood by Kendare Blake and Mind Games by Kiersten White. My other acquisition over the weekend was thanks to my mother, who happened to find a brand new used book store in town. I haven’t been there yet, but she says that it’s awesome. Since she knew I was reading some of the Mercedes Lackey Valdemar books, she bought Oathbound, the first book in the Vows and Honor trilogy. It was on clearance for only $0.50. I must go visit this used bookstore sometime. Soon. I have a question for you – how many unread books are on your shelves and how many read? Do you ever get rid of any of them? You’re asking me to count my books? Sheesh, this will take a while. I’ll answer on my blog at some point.